No, there’s no such thing as an orange cranberry. . . at least there wasn’t! 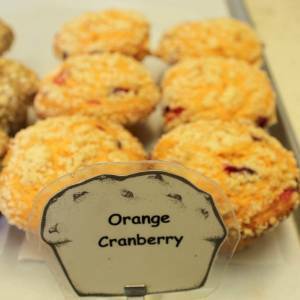 Not only is there an orange cranberry but it’s been baked into a muffin. This giddy treat combines the citrus with the bitter-sour in a complex democracy of flavors. So democratic in-fact that it nearly won a Nobel Peace Prize for its contribution to the harmony of the world! The first muffin in history to be given the distinction.